Daniel Lanteigne. Creative Commons BY-NC-ND. The first thing you notice when you walk through the streets of Hazaribagh is the horrible and seemingly all-pervasive stench of tanning chemicals. 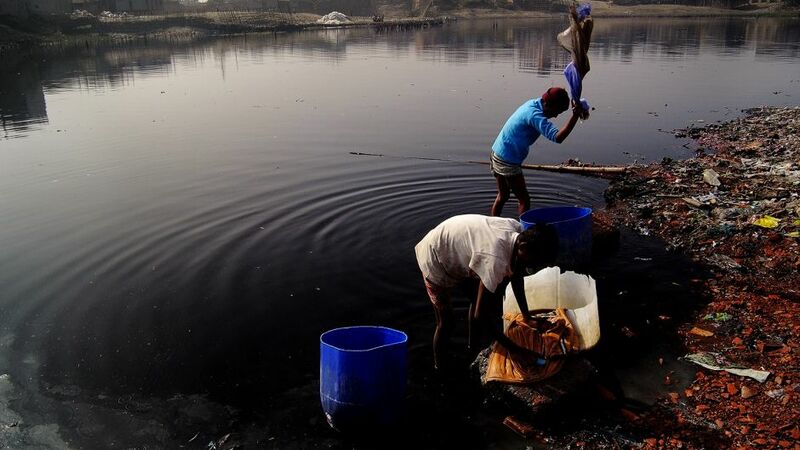 According to the Department of Environment, the tanneries discharge 22,000 cubic meters of untreated liquid toxic waste daily into the rivers, gutters and canals that run alongside in the roads of Hazaribagh. Toxins are also leaching into groundwater. Business as usual in Hazaribagh. 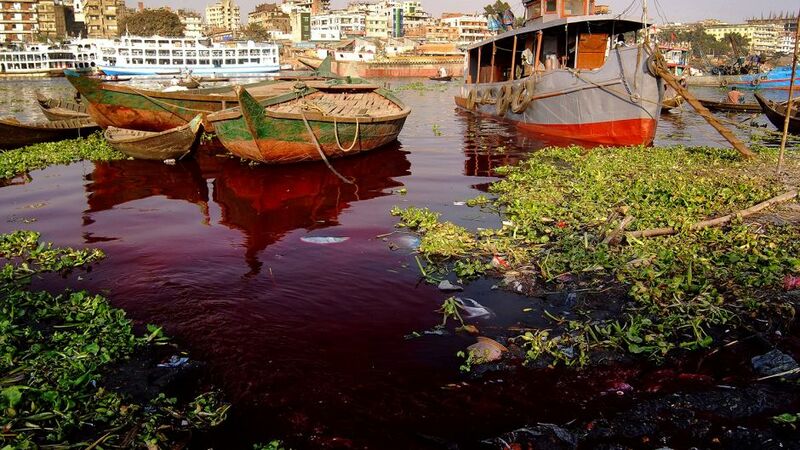 The tanneries evacuate 22,000 cubic meters of untreated liquid toxic waste daily into the Buriganga. Photo: Daniel Lanteigne. Creative Commons BY-NC-ND. The chemicals end up forming coloured ponds and lakes of toxic waste in residential areas and are causing much harm to the 20,000 people who work and live in the tanning district. Most are suffering from chronic respiratory problems, skin diseases and even destruction of the nasal septum. Workers process rawhides with toxic chemicals such as chromium, sulfur and manganese to name a few. 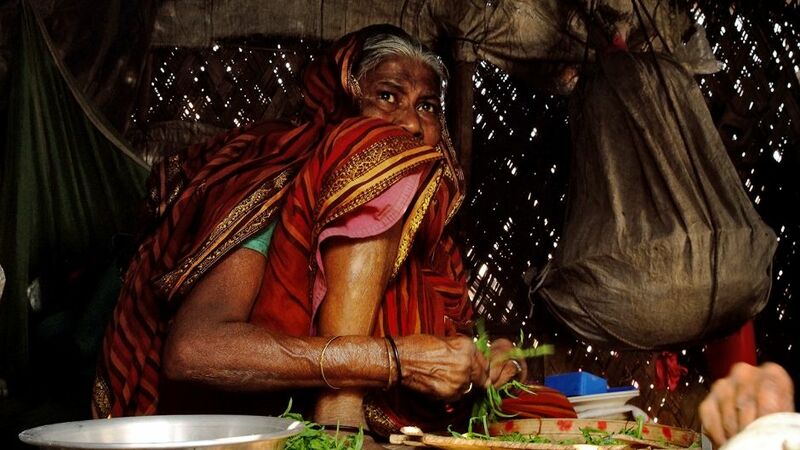 They handle leather skins soaked with acids and dyes with their bare hands in poorly ventilated tanneries where often the only light coming in is through cracks and openings in the walls. Workers stand knee deep without any protective clothing in tanning water as they transfer rawhides into another tank. Photo: Daniel Lanteigne. Creative Commons BY-NC-ND. Rahman’s fears are well-founded; just this past March, three workers died of chemical inhalation. With his education, Rahman was fortunate to be able to move and look for another job. For most of the people in Hazaribagh this is simply not possible — they have no choice but to work and live there. “The owners of these tanneries are not highly educated… they don’t know that their procedures are destroying the environment, they do not understand it well,” Rahman says. All the toxic wastewater eventually makes its way into the Buriganga River, which is considered to be Dhaka’s lifeline. Thousands of people depend on the river daily for bathing, washing clothes, irrigation of food and transportation of goods. The river has suffered extreme biodiversity loss and has now turned black. With water scarcity a reality, many don’t have a choice but to continue washing their clothes in the Buriganga. Photo: Daniel Lanteigne. Creative Commons BY-NC-ND. “The pollutants have eaten up all oxygen in the Buriganga and we call it biologically dead. It is like a septic tank,” Khawaja Minnatullah, a World Bank specialist on environment and water management, told Reuters reports last year. After decades of discussion on the topic, a relocation project was launched in 2003 to move the tannery district to a remote location near Savar, north of Dhaka, where all tanneries would share a Central Effluent Treatment Plant (CETP) as there is no room to build one at Hazaribagh. Despite the fact that the State Minister for Environment and Forests, Dr. Hasan Mahmud, just weeks ago claimed that the government has taken steps to finally set up the CETP, it is entirely possible that the relocation project will not meet the recently extended deadline, after already missing the original time frame set by the country’s High Court when it ordered the shut down of the Hazaribagh site last year. Uncertainty looms among the residents of Hazaribagh over talk of moving the tanneries to an area outside of Dhaka. Photo: Daniel Lanteigne. Creative Commons BY-NC-ND. The project has languished mainly thanks to bureaucratic wrangling over the compensation fund and debates over who would pay for the treatment plant. Initially, a memorandum of agreement was signed between the government and the tanning association, stating that the government was to bear the expense of the plant. After subsequent review, the government then added a provision indicating that the tanning association would have to repay the cost of such a plant over the course of 20 years. Industries Minister Dilip Barua is now offering to pay 85% and asking the tanneries to kick in the rest. 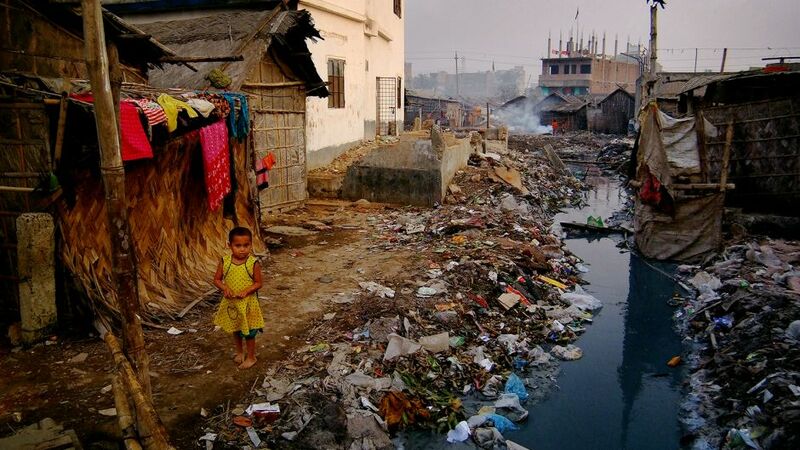 Bangladesh’s Environment Conservation Rule of 1997 stipulates that every industrial unit should have its own effluent treatment plant, without which it will not get electricity or gas connections. Enforcement of such laws would have a considerable impact on the condition of the Buriganga River as well as improving the health and safety of the population. In January 2010, an effort was made to start cleaning the Buriganga’s riverbed. The Buriganga Cleansing Project involves excavating 10 to 12 feet of sludge from the riverbed for a 3 km stretch and is set to last until June 2011. But sporadic efforts to cleanse the river are not enough considering that, while the project aims to remove 1,000 tonnes of sludge from the Buriganga riverbed each month, the tanning industry continues to feed 25,000 tonnes of untreated wastes and 40,000 tonnes of toxic chemicals into the river every day. With little and old equipment, the riverbed excavation project aims to remove 3,000 tonnes of sludge from the riverbed. The mammoth task that has generated much skepticism in the media inches along at a snails pace. Photo: Daniel Lanteigne. Creative Commons BY-NC-ND. Public pressure and media scrutiny will perhaps help. 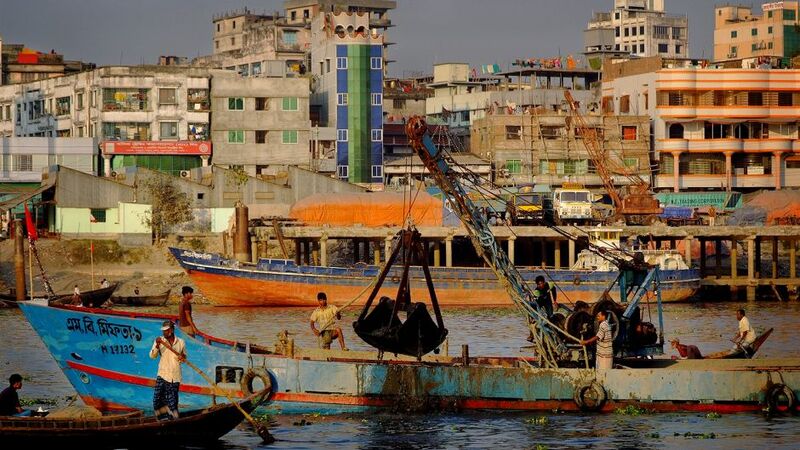 After one report by Dhaka’s Daily Star newspaper, The High Court last week announced that it wants the government to deploy police to the banks of the Buriganga to stop disposal of waste into the river. Certainly, the experts are calling for action. Dr. Mohammed Ataur Rahman, Director of the Program on Education for Sustainability at the International University of Business Agriculture and Technology, says “measures to mitigate the rising water crisis” are urgently needed. Further, there are those who believe Bangladesh’s tanning industry can indeed be cleaned up and made more sustainable. 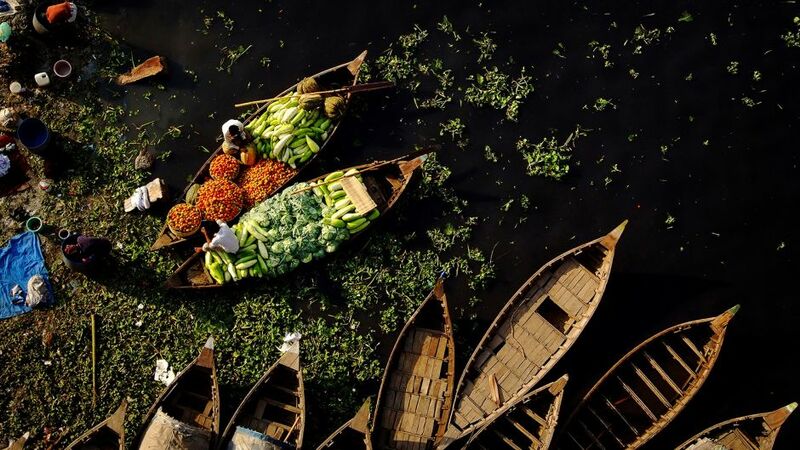 Over the black waters of the Buriganga, merchants unload shipments of fresh produce destined for city markets. Photo: Daniel Lanteigne. Creative Commons BY-NC-ND. So — for the sake of the Buriganga River, the ecosystems that depend on it, and the health of the people of Hazaribagh — all Bangladeshis and empathetic international community members should continue clamouring for the solid enforcement of relevant laws and the development of comprehensive governmental strategies that are followed through expeditiously. The true colour of water must, after all, be clear to be life-giving. 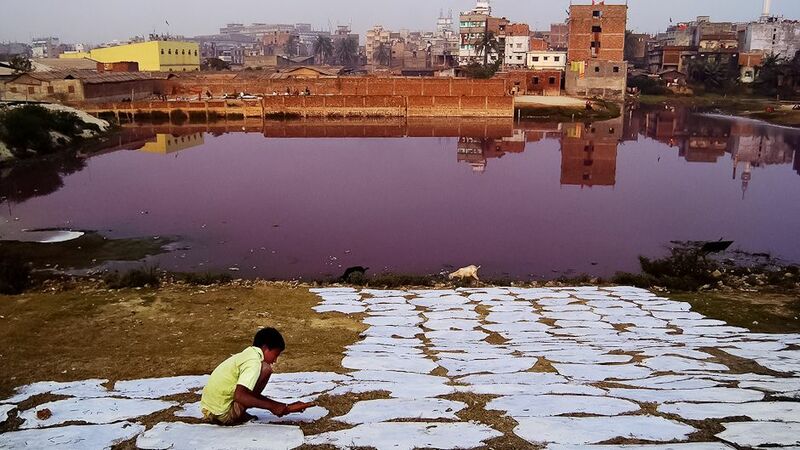 Colours Of Water: Bangladesh’s Leather Tanneries by Daniel Lanteigne is licensed under a Creative Commons Attribution-NonCommercial-ShareAlike 3.0 Unported License. Daniel, The article and photo essay are excellent. Everytime I show the photos to someone they are lost for words. How can this be possible? Why do we accept such a tragic way of life for so many people? I am so impressed that you took the time to explore this issue and to try to bring it to public attention. Sadly it appears they are all asleep. city Dhaka to be relocated in coastal areas. need for the leather industry of Bangladesh. products. So transportation cost can be minimized. cheaply available in coastal area at almost no cost.